Without further ado, let’s jump into the MAC East. There is a lot to like about Ohio’s chances to win the MAC East. They return a total of 18 starters with 10 on offense and 8 on defense. Their lone loss on offense was their top receiver from 2014, but his production (21 catches for 443 yards and 1 touchdown) can be replaced with the second, third, and fourth leading receivers returning. The quarterback battle will be between JD Sprague and Derrius Vick, but whichever one wins the battle will do well lead the offense. 2014’s leading rusher was AJ Oullette who ran for 785 yards and 7 touchdowns on 160 carries (4.9 yards per carry). On defense, the Bobcats lose two linemen and a defensive back. They return their top three tacklers (Quentin Polling, Jovon Johnson, and Blair Brown), who all play at linebacker. The defensive backfield is stocked full of seniors at all positions while the defensive line is full of upperclassmen. If Ohio is to win the MAC East they will have to overcome a tough trio of in-conference games. They get an up and coming Western Michigan team at home on October 17, but have road tests at Bowling Green (November 4) and Northern Illinois (November 24). If Ohio can at least beat Bowling Green, they will be in excellent position to win the MAC East. 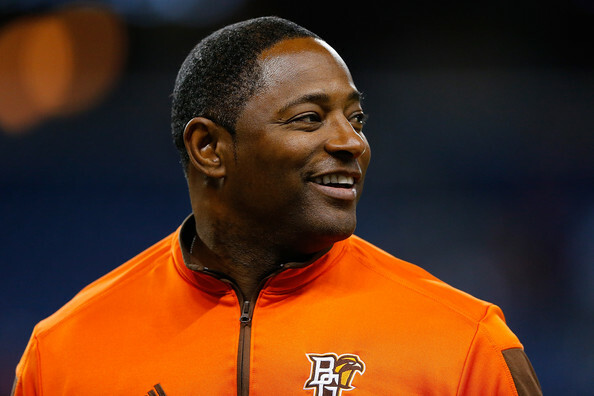 The favorite to win the MAC East belongs to the Bowling Green Falcons under second year head coach Dino Babers. BG won the MAC East last year, but was crushed by Northern Illinois 51-17 in the Title Game. What is really scary about the Falcons is that they return 10 starters from an offense that averaged 30 points a game. There is no reason to expect that average to go down with a full year in the system and two experienced quarterbacks in Matt Johnson and James Knapke. Scary indeed. The one area of concern for Bowling Green is on defense where they return 5 starters from a unit that surrendered 33.5 points per game in 2014. The losses are immense in the back seven with 5 starters gone from the linebacker and secondary units. The top four tacklers are also gone with several inexperienced players projected to start. One player that is coming in and expected to start is Eilar Hardy from Notre Dame at the strong safety position. The MAC East will likely come down to a matter of three games in the span of two weeks. They will face Ohio at home on November 4 and then take on Western Michigan on the road November 11. The gauntlet ends with Toledo visiting Bowling Green on November 17. A 2-1 record in those games, especially a victor over Ohio, will probably give them the inside track to win the division. There is no doubt that Mark Whipple made an impact on this team in 2014 in his first year back at the helm. The team lost by field goals to Colorado and Vanderbilt while playing Bowling Green, Miami (OH), and Toledo close, losing those three games by a touchdown or less. UMass beat Kent State, Eastern Michigan, and Ball State to finish 3-9. In 2015, the Minutemen return a total of 19 starters with 10 on offense and 9 on defense. The offense was vastly improved last season going from 11.7 points per game in 2013 to 27.3 in 2014. Quarterback Blake Frohnapfel will be leading the offense for the second straight year after throwing for 3,345 yards (55.1%) with 23 touchdowns against 10 interceptions. He also has his top target in Tajae Sharpe back (85 catches for 1,281 yards and 7 touchdowns). The offense will continue to put points on the board in 2015. The defense, however, will need to improve drastically if Massachusetts wants to make their second bowl game in school history. In 2013, they gave up 33 points per game and did the same in 2014 with five starters back. Nine starters return in 2015 and it would be surprising if they did not improve across the board. Under this 3-4 system, UMass has seven seniors projected as starters in the linebacking and secondary units. UMass has also been given a favorable schedule in their final season in the MAC. They face Bowling Green on the road, but draw Toledo at home and will not play fellow MAC East opponent Ohio in 2015. They will also face a couple of Western Division bottom feeders in Ball State and Eastern Michigan. UMass could be headed to a bowl game in 2015. It has been a decade since Akron made a bowl game, but they have been close the past two seasons with back-to-back 5-7 records. They return six starters on offense led by quarterback Kyle Pohl. He threw for 2,189 yards (54.3%) with 9 touchdowns and 8 interceptions in an injury plagued season. He will need to stay healthy because he does not have his top two receivers from a year ago nor does he have the top returning rusher. The second leading rusher in 2014, Conor Hundley, ran for 540 yards and 4 touchdowns on 104 carries. The offensive line looks like the strength of the offensive with four senior starters and could be key to helping the Akron offense. Like offense, the defensive side of the ball returns six starters as well. The strength appears to be on the defensive line with three returning starters coming back from a unit that allowed only 149 yards rushing per game in 2014. The defense loses 8 of the top 11 tacklers, but the top tackler in Jatavis Brown will anchor the linebacking unit. He had 99 stops, 4 sacks, and 10.5 tackles-for-loss last season. The secondary loses two starters, but should be decent in 2015. The schedule was kind to Akron. From the MAC West they drew Eastern Michigan and Central Michigan, two teams that are expected to be near the bottom of that division. They get Ohio for homecoming on October 3, and have road games at Bowling Green and Massachusetts. Akron has a real chance at making their second bowl game in school history in 2015. 2015 will be a season of change for the Buffalo Bulls. They made a splash hire by taking Lance Leipold away from Division 3 Wisconsin-Whitewater. At Whitewater, Leipold won 6 National Titles in 8 seasons while making the National Championship 7 times. While he should not be expected to win a National Title in Buffalo, he should have them contending in the MAC within a few years. Leipold inherits seven starters on offense including the top returning quarterback, running back, and wide receiver. Joe Licata threw for 2,647 yards (64.9%) with 29 touchdowns and 11 interceptions, Anthone Taylor ran for 1,403 yards and 12 touchdowns (5 YPC), and Ron Willoughby caught 50 passes for 771 yards and 9 touchdowns. Leipold has the pieces in place on offense to run his system well in his first season. On defense, Buffalo returns only four starters from a defense that gave up 31.5 points and 398 yards per game. The top four leading tacklers from 2014 depart and the biggest loses come in the secondary. They lost three starters that accounted for 90 career starts. It is hard to see the defense improving drastically with the experience and talent lost from last year. To win the MAC East, Buffalo will need some help. The face Bowling Green at home to start conference play on October 3 and they were able to draw Central Michigan from the West. However, they will have to play Northern Illinois at home in November. Buffalo has a chance at getting to six wins with some wins in the toss up games. It has been tough for Kent State since Darrell Hazell‘s departure after the 2012 season when they went 11-3. They have gone a combined 6-17 in 2013 and 2014 while the offensive numbers have slipped and the defensive numbers have gotten worse. Kent State has 8 players coming back on offense, their most since 2011, which was Hazell’s first season in charge. They have to replace a wide receiver, tight end, and center, otherwise the offense remains intact. Quarterback Colin Reardon has been the starter since the beginning of 2013, but saw a small dip in his numbers last year. He loses his top two receivers, but adds in former West Virginia player Connor Arlia. The running game should also be just fine with Nick Holley returning as starter. Defensively, Kent State has 9 starters coming back from a defense that gave up 29 points and 430 yards a game in 2014. The biggest area of improvement needed is stopping the run, as Kent State gave up an average of 214 rushing yards per game and 4.8 yards per carry. The two starters need to be replaced on the line. Overall, Kent State returns their top 11 tackles from a season ago and the entire secondary returns, which gave up only 216 yards passing per game. That will be the strength once again. Kent State has some tough games if they want to win the MAC East. They have back-to-back road games at Toledo (October 10) and Massachusetts (October 17). That is followed up with a home game versus Bowling Green on October 24. After a bye week, they face a winnable game against Buffalo on November 5, but have a quick turnaround to face Ohio on the road November 10. Year 1 under Chuck Martin saw improvement from the Redhawks. They improved their win total by two, but more importantly they improved on offense and defense. The offense went from 9.8 points per game in 2013 to 22.3 in 2014. The defense went from 35.7 points per game to 31.8 despite only 6 six starters returning. The unfortunate part for Miami in 2015 on offense is the return of only four starters. They lost their top quarterback, rusher, and receiver from 2014, which puts them in a bad position. The projected replacements at both quarterback and running back are redshirt freshmen. The lone bright spot is the second, third, and fourth leading receivers return. Expect some worse numbers from the offense this season. The Redhawks will probably continue to improve on defense with 8 starters coming back. The defensive line should improve after giving up 200 rushing yards per game in 2014 as all four starters return. Two of the three linebackers return to help the rush defense including 2014’s second leading tackler in Joe Donlan. The secondary returns two starters as well with the top tackler in 2014 returning in Heath Harding (98 tackles). The defense should improve, but it will need to be a lot better if Miami has hopes of getting near bowl eligibility. Miami has a tough year ahead in 2015. They have only one winnable game in non-conference action (Presbyterian opening week) and only a few in conference. They drew Northern Illinois, Western Michigan, and Eastern Michigan from the MAC West with only the latter being possible as a win. It looks to be another long season for Miami. The MAC East appears to be coming down to Ohio and Bowling Green. Bowling Green will have an incredibly potent offense while Ohio has more experience returning on both sides of the ball. The meeting between those two teams on November 4 could decide the MAC East representative in the Championship Game. Outside of those two, Akron, Massachusetts, Kent State, and Buffalo will be vying to make bowl eligibility. Meetings between those teams could determine who makes a bowl game and who does not. Check back on Friday, July 3 to see the MAC West Preview and who will be predicted to win the MAC Championship in 2015.